The culture of chanoyu is unique to Japan. For a while, after the custom of drinking tea had been transmitted to Japan, people just enjoyed the taste of the tea, but in due time utensils for drinking tea, the way of preparing tea and a place for drinking it were specially created and this was the prototype of today's chanoyu. As for the thinking behind chanoyu, the medieval aesthetic of wabi (taste for the simple and quiet) produced wabi-style tea. Chanoyu is said to be a traditional culture, but at the time that it appeared it was something completely new that could even be called revolutionary. 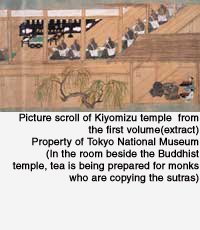 For example, the chashitsu (tea room), a type of architecture which had not previously existed in Japan, was created, as well as the chawan (tea bowl), kama (kettle) and hanaire (flower container). These were specially for chanoyu, which makes one wonder at the originality of chajin (tea devotees) in the early years. The tradition of chanoyu was transmitted through the Edo Period by families of tea devotees, but within this tradition new utensils and temae (tea procedures) and new ways of thinking about chanoyu were developed, according to the demands of the age. This has continued until the present day. The length of time that one practices, whether five years or ten years, is not the only thing that matters. There are actually six hundred years of chanoyu history as a background from which practice has emerged.